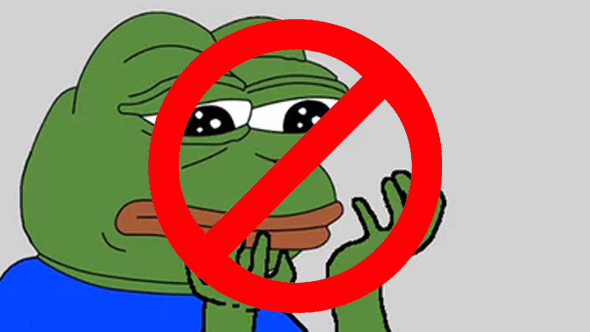 Images of controversial meme Pepe the Frog that were being sold in the Steam Marketplace have been removed. The character’s creator, Matt Furie, issued DMCA takedowns to Valve who then blocked the images. Here’s a list of some of the best PC games. Pepe the Frog was first created by Furie in the 2005 comic series Boy’s Club, and became a popular meme across several sites, including 4chan. Over time, Pepe has become a symbol of the alt-right, prompting Furie’s publisher Fantagraphics Books to release a statement condemning “illegal and repulsive appropriations” of the Pepe image. 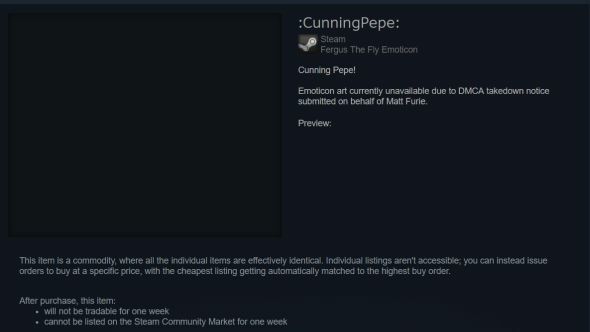 The Steam marketplace price of one of the emoticons, ‘Cunning Pepe’, dropped significantly last night, from an average of around $0.60 to a low of $0.23. Despite the fact that the icon is now entirely blank, some versions of the emoticon have been sold since the takedown. Though, Valve are unlikely to issue a refund as in the past they, when they were forced to replace the well-known Kappa emote, no refunds were issued.